I have always repurposed clothes for play costumes but rarely do anything for myself. Well, those days are over!!! I now have a stack of refashioning projects. Yeah. more projects. Just what I needed. Anyway, it's fun, right? And eco-friendly. 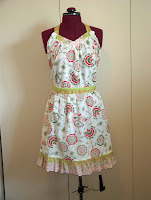 And I'm getting an Anthropologie-style apron for a few bucks and some elbow grease. 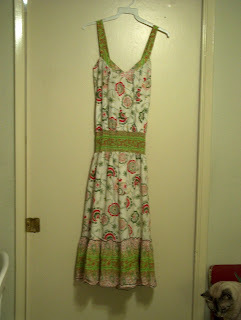 I found this gross and too large dress at the thrift store for about $4. The fabric was great though so I got it. Hi kitty! I didn't realize he was in the shot! Weird how many sewing bloggers are cat ladies. Anyway, I sat and unpicked all the stitches...NOT! I cut the dress apart at the seams. It's an APRON people. Sorry, I didn't mean to yell. I got rid of the weird elastic shirred waistband. Also cut the bottom ruffle into two pieces lengthwise, not quite equal widths. One piece became the waistband and ties and the other piece went back on the bottom because I thought it was a little short without. I actually put the top band back on the way it was and angled and stitched down the ties to tie like a halter instead of going down the back like it was made to do. For the picture I clipped on a pair of vintage earrings for some sass. Hi darling! Thanks so much for your link to the Freelancer's blog. OMFG it she is amazing. The apron shots are good, the lighting is nice, perhaps you should try there! I yell all the time to emphasize things. I don't often *emphasize*, I EMPHASIZE instead! I talk really loudly in real life, so when I see you YELL like that in a post, I just imagine you're pretty excited about it and are just talking louder than normal. I just found your blog through Wardrobe Refashion. 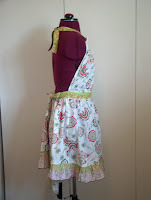 I love what you did with the dress/apron. Stinking adorable! The first thing that grabbed me about your blog (after the title *heart*) was the Coco quote. I've just finished watching the Coco Chanel movie with Shirley MacLaine and am dying to see the Audrey Tatou one! I'll be back to see what else you come up with.